We want to make clear that the results in this report are intended to give only an indication of the impact on system performance (mainly by the real-time/on-access components) of the various Anti-Virus products in these specific tests. Users are encouraged to try out the software on their own PC’s and form an opinion based on their own observations. The tests were performed on a machine with Intel Core i5-3330 CPU and 4GB of RAM. The performance tests were done on a clean and fully updated Microsoft Windows 7 Professional SP1 64-Bit system (English) and then with the installed Anti-Virus software (with default settings). The tests have been done with an active internet connection to simulate real world impact of cloud services/features. The hard disks were defragmented before starting the various tests, and care was taken to minimize other factors that could influence the measurements and/or comparability of the systems. Optimizing processes/fingerprinting used by the products were also considered – this means that the results represent the impact on a system which has already been used by the user for a while. The tests were repeated several times (with and without fingerprinting) in order to get mean values and filter out measurement errors. After each run, the workstation was defragmented and rebooted. We simulated various file operations that a computer user would execute: copying (we used around 3GB of data consisting of various file types and sizes (pictures, movies, audio files, various MS Office documents, PDF files, applications/executables, Microsoft Windows 7 system files, archives, etc.).) different types of clean files from one place to another, archiving and unarchiving files, installing and uninstalling applications, encoding and transcoding (converting MP3 files to WAV, MP3 to WMA and AVI to MP4) audio and video files, downloading files, launching applications, etc. We also used a third-party industry recognized performance testing suite (PC Mark 7 Professional) to measure the system impact during real-world product usage. Readers are invited to evaluate the various products themselves, to see how they impact on their systems (such as software conflicts and/or user preferences, as well as different system configurations that may lead to varying results). Security products need to load on systems at an early stage to provide security from the very beginning – this load has some impact on the time needed for a system to start up. Measuring boot times accurately is challenging. The most significant issue is to define exactly when the system is fully started, as many operating environments may continue to perform start-up activities for some time after the system appears responsive to the user. It is also important to consider when the protection provided by the security solution being tested is fully active, as this could be a useful measure of boot completion as far as the security solution is concerned. Some Anti-Virus products are loading their services very late (even minutes later) at boot (users may notice that after some time that the system loaded, the system gets very slow for some moments), so the system looks like loading very fast, but it just loads its services later and makes the system also insecure/vulnerable. As we do not want to support such activities, we still do not measure boot times. To support our concerns, we sporadically check in performance tests if the products are loading all their protection modules before e.g. malware in the start-up folder is executed. Several products failed this test, except AVG, Bitdefender, eScan, Kingsoft, Microsoft and Sophos. Those were the only products that detected and blocked the malware before its execution after system start-up (by loading itself at an early stage); in all other cases, first the malware was successfully executed and only later detected by the AV products, when it was already too late. These specific test results show the impact on system performance that Anti-Virus products have, compared to the other tested Anti-Virus products. The reported data just give an indication and are not necessarily applicable in all circumstances, as too many factors can play an additional part. 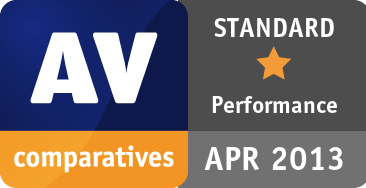 This publication is Copyright © 2013 by AV-Comparatives ®. Any use of the results, etc. in whole or in part, is ONLY permitted after the explicit written agreement of the management board of AV-Comparatives prior to any publication. AV-Comparatives and its testers cannot be held liable for any damage or loss, which might occur as result of, or in connection with, the use of the information provided in this paper. We take every possible care to ensure the correctness of the basic data, but a liability for the correctness of the test results cannot be taken by any representative of AV-Comparatives. We do not give any guarantee of the correctness, completeness, or suitability for a specific purpose of any of the information/content provided at any given time. No one else involved in creating, producing or delivering test results shall be liable for any indirect, special or consequential damage, or loss of profits, arising out of, or related to, the use or inability to use, the services provided by the website, test documents or any related data.